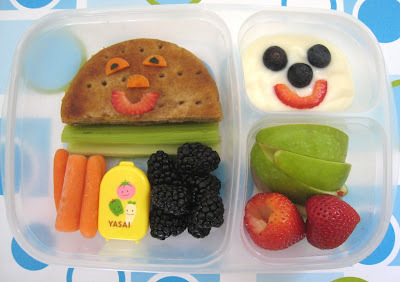 Contents: Grilled cheddar & anjou pear on whole grain sandwich rounds (carrot face with strawberry smile), celery, carrots, dip, blackberries, vanilla yogurt (blueberry/strawberry face), green apples, and strawberries. Notes: Man, this lunch is loaded with fruits and veggies. I know my son would absolutely devour this, and I think most younger kids would as well, before they become too attached to sugar and fat. Shannon made this for her 4 year old son. It's a new school year! What's for school lunch? This looks so fun and yummy. Presentation goes a long way! I just read through several pages of your blog and many times I just thought, "Wow, that lunch look so sad". I'd love to see a study on what effect "sad" looking lunches have on children vs. "happy" lunches. I love this! My 17 yr. old daughter (who will often skip meals if given a choice) enjoys it when I make her a "bento box" of little bits of everything for a snack while she's doing her homework. No fruity smiley faces, but the same idea as above, with whole grains, fruit and veggies, and yogurt/peanut butter dip for the apples. This lunch is perfectly doable for 600 kids. Just take away the smiley faces. It would be a great project for the kitchen staff to start when they get in in the mornings, and finish around lunch time. Just prepping and being efficient. HaHaHaHa - too funny. I work in a public school lunchroom and I'd be a rich woman if I had a dime for all the "healthy lunches" from home that I've seen dumped into the garbage. Upon asking a student if his mom knows that he doesn't like the veggies, he replied "No, but that's okay it makes her feel better to put them in my lunch." I've also witnessed a student in tears because a server put cucumbers on his tray after telling them he didn't want any. Don't pass judgment until you've actually worked in the system. Hmm... I've actually worked in a school, and I've seen many children enjoy fresh vegetables. You may choose to subject your children to obesity by getting them hooked on junk, but not all parents do. If you get children used to eating healthy food at a young age, they can and will grow up loving it.